Today I would like to share with you an adorable image from Your Next Stamp's digi line which soon, will no longer be available. So be sure to grab those images you want now before you no longer can. This image I am using for my card is called Best Friends. This is just too cute for words! When we had our dog, my boys would be just like this with her. This image was printed on Neenah cardstock and colored in with Copics. I paired this with some patterned paper from MME once the image was cut out with my lacey squares nesties from Spellbinders. The sentiment is Your Next Die of scripty words finished with some twine, a button, and some rhinestones. That is about it for me today and I hope you all have a great weekend. Thanks for stopping by as I love all my visitors! Today's Friday Fun Project with YNS is using Love Painting, a new digi release. It's another super cute image with many potentials of what you can use it for. I paired it up with the current YNS Challenge sketch. I printed the image on Neenah cardstock and colored it in with Copics. I added some texture to his fur by using a wash cloth and some colorless blender solution. Here is my tutorial of how if you are interested in learning how. I thought it would be fun and cute to make it look as though he was still painting by only partially coloring in the heart and to make it look a little "wet," I added some Glaze pen over it. It's hard to photograph that but a glaze pen by Sakura is not like using Glossy accents or anything- it's more subtle with a light shine. The card was then completed with some YNS Gumdrops and the patterned paper used is MME Hootenanny. Here is this months sketch. Be sure to play along and link up for your chance to win! 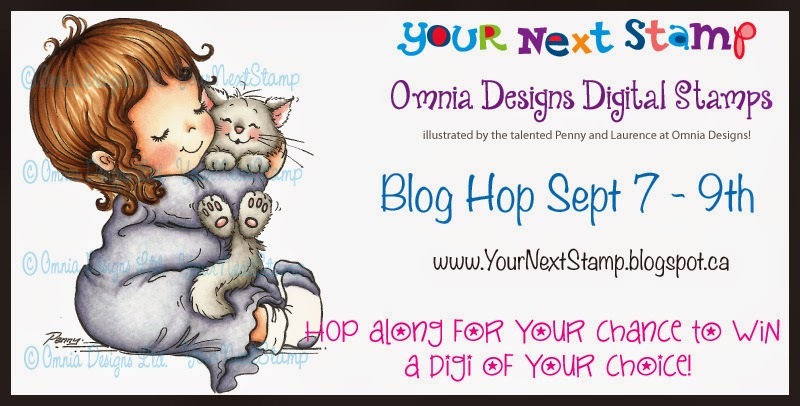 Hello and welcome to our September Your Next Stamp Digi Blog Hop. The Digi Team have worked hard to complete some awesome projects for this hop! We have EIGHT new digi stamps in the store and an announcement to make today. After much consideration, we have decided that Your Next Stamp will go back to it's rubber roots and we will be discontinuing the Digital Stamp line from the store in October 2014. We all know how much you have come to love the cute characters from the Omnia line and we are happy to still offer the whimsical images in cling mount form. You will still be able to purchase all Digital Stamps until October 2014 and with the sale offered below, you will want to stock up now! The new release hop begins on Anita's blog and if you've been hopping along, that is where you should have arrived from. Make sure you hop around to all of the blogs featured in the link list located at the bottom of this post for lots of inspiration using the new products! If you leave a comment on all of the blogs, you will be entered to win a a digi stamp of your choice - there will be four winners and four prizes given away in total. The lucky winners will be announced on the Your Next Stamp Blog September 10th. For my project I am using the adorable Sporty which is colored with Copics and a little texture added to his fur by adding some colorless blender solution and a washcloth. Sporty is then popped up over the patterned papers from MME. The card is then finished with some self adhesive rhinestones for additional elements. 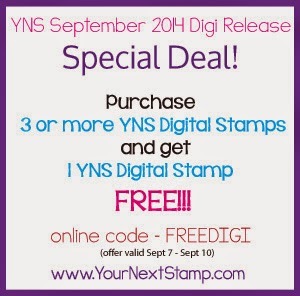 Now is the time to stock up on all the digi stamps - Buy three and get one free with the code below! Now it's time to head on over to Bonnie's blog, but before you go, don't forget to leave a comment. Today I am sharing with you another fun image from Flat Friends Boutique along with the new sketch 76 from Friday Sketch Challenge. Flat Friends is this challenges' sponsor, so be sure to play along for your chance to win! I kept this card pretty exact to the sketch and I used some patterned paper from my scrap stash which unfortunately, do not know who it is made by. I paired it with some SU! 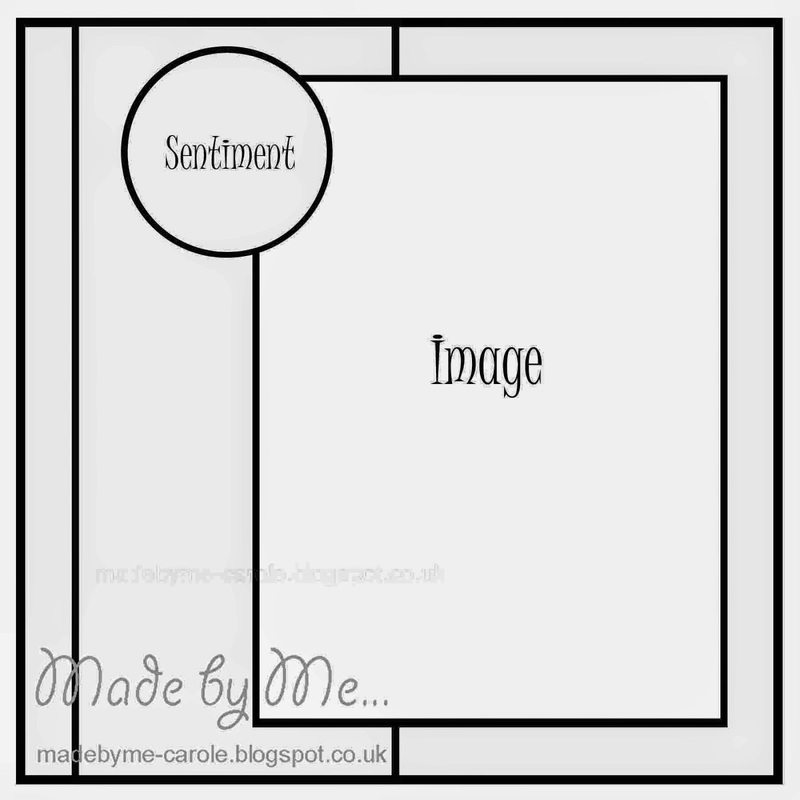 CC cardstock to layer with before popping up the image and sentiment. The sentiment is also SU! that I have had for years! It was a celebration set from maybe around 2006? Time is certainly not standing still! :) The image is colored with Copics and for a finishing touch, I added some glaze pen to the glasses for a little gloss. Come play along with the DT and don't forget to link up! Thanks for stopping by and have a great Friday!